Photo from left to right: Aspirant President Mike McClaine, Office of Mayor Assistant Chief of Staff Lindsay Powell, WC&S Interim CEO and Chief Program Officer Nicole Molinaro Karaczun, and Aspirant Client Engagement Manager Kristen Gabrielli. Aspirant and Women’s Center & Shelter of Greater Pittsburgh (WC&S) held a launch event for the Pittsburgh community to release the new version of the RUSafe mobile app, along with other life-saving resources, to ‘empower our region to advocate, protect, and provide hope for millions of lives impacted by domestic violence.’ Joining in the celebration as supporters of this initiative were the Office of the Mayor, United Way of Southwest PA, Southwest PA Says No More, and business and community leaders. To commemorate this event and the launch of the RUSafe app – developed by Aspirant and officially launched first within the Pittsburgh community – Lindsay Powell, assistant chief of staff, Office of Mayor William Peduto, presented a proclamation declaring June 27 as WOMEN’S CENTER & SHELTER OF GREATER PITTSBURGH CONNECTION OF HOPE DAY, in Pittsburgh, Pennsylvania. Connection of Hope is also the name of Aspirant’s larger campaign to raise awareness of and help prevent domestic abuse. 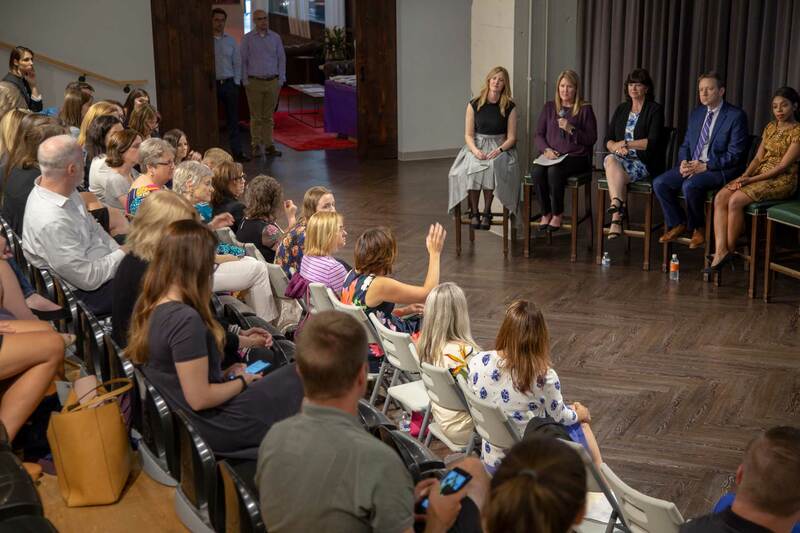 The event, which included two sessions to accompany guests, was attended by more than 225 attendees, and designed to build awareness and recruit volunteers to champion domestic violence intervention and provide information and tools, including the RUSafe app, to share in their communities – and reach those who need it most. RUSafe is now available to download across the United States, and Aspirant and WC&S are planning a national launch event in fall 2018. Audience members at Alloy26 asking questions to the speaker's panel. From left to right: Aspirant Accounting Specialist Ashley Sprowls, RUSafe Coordinator Kathy Marecic, WC&S Interim CEO and Chief Program Officer Nicole Molinaro Karaczun, President Mike McClaine, and Office of Mayor Assistant Chief of Staff Lindsay Powell. This release comes shortly after Aspirant developed and launched a new version of its Bright Sky app in the UK with Hestia and The Vodafone Foundation. The app is the UK's first mobile app to help people affected directly by domestic abuse, as well as friends, family members and colleagues who may be concerned about someone they know. The new version was officially released in May 2018. 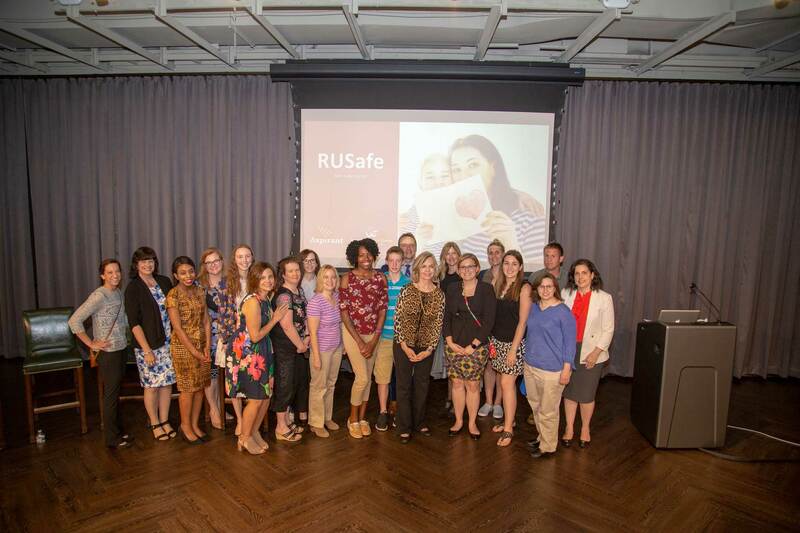 WTAE’s Sally Wiggin, who is on WC&S’ Advisory Board, emceed the event, which featured speeches by Aspirant President Mike McClaine and WC&S’ Interim CEO and Chief Program Officer Nicole Molinaro Karaczun about the history and importance of RUSafe. Then RUSafe Coordinator Kathy Marecic introduced the new app and its features, and Ashley Sprowls gave an overview of a toolkit -- including flyers, business cards, information about RUSafe, and more -- that attendees would be taking home to help share the app in their communities. Wiggin then led a question and answer section to finish off each of the two sessions. 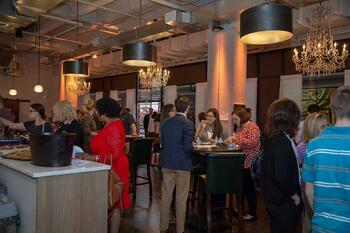 Attendees mingling before the event at Alloy26. 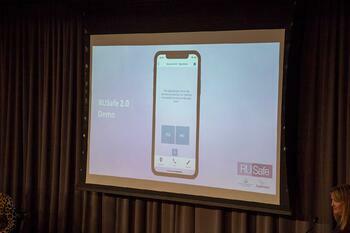 RUSafe Coordinator Kathy Marecic, presenting RUSafe's new features. A group of attendees, speakers, Aspirant and WC&S employees, and volunteers gather after Session 1 of the evening. WTAE's Sally Wiggin emceed the event. If you’re interested in supporting this cause and/or working with Aspirant, please contact Client Engagement Manager Kristen Gabrielli at kristen.gabrielli@aspirant.com or Marketing Communications Manager John Conroy at john.conroy@aspirant.com. And if you would like a toolkit of your own to share information in your community, email RUSafe Coordinator Kathy Marecic at rusafe@info.net.